I am never one to tell someone to stop short of their dreams. 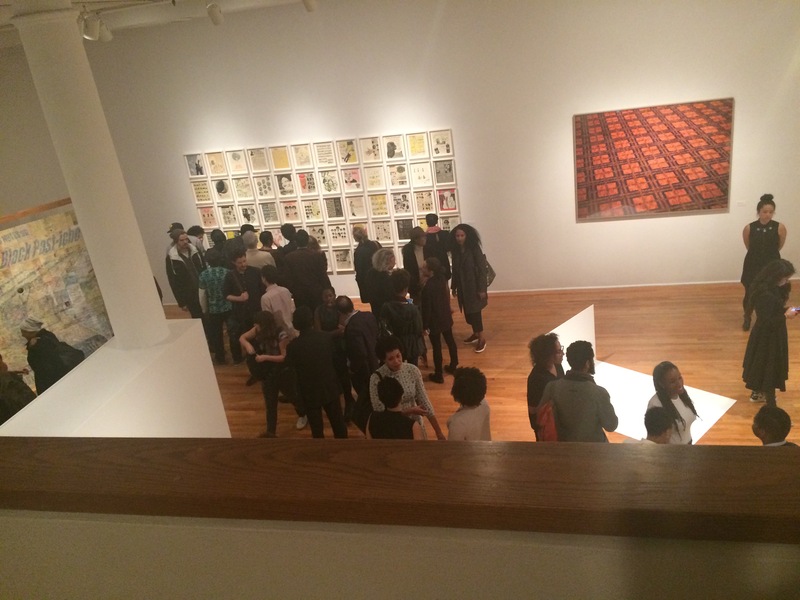 Look at these students, who without even thinking had their artwork featured in a museum. As reported on Mashable and other sources, Ruari Gray, a student at Robert Gordon University in Aberdeen,Scotland left a pineapple in the museum as a joke. The pineapple ended up on display in a case. Someone will point to how much this devalues the art world, but what we should focus on here is everyone’s inner artist. Besides, pineapples are welcoming and experiencing a real fashion world moment now (more on that later). And here’s a Boy Meets World clip where Eric shows off his inner art critic. If you didn’t see a monkey and a coconut, maybe you won’t appreciate the pineapple either. Space Matters- I love you in a place…. Between the John Boyega and Star Wars awards discussions, Star Trek reboots, and the casting of Hidden Figures- a movie about African American female mathematicians at NASA from the 1950s through 1980s- it is clear that our cultural fascination with space is not subsiding anytime soon. Space matters. In every intersection from science fiction franchises to STEM careers, the importance of diverse images stands just as it does for television shows or college campuses. Of course, art is culturally in tune. Afro-Futurism is becoming more of a household phrase, not one simply used by art world insiders. But of course, this is not new. Because if the renewed interest depicts anything, it is that people have been about this life. 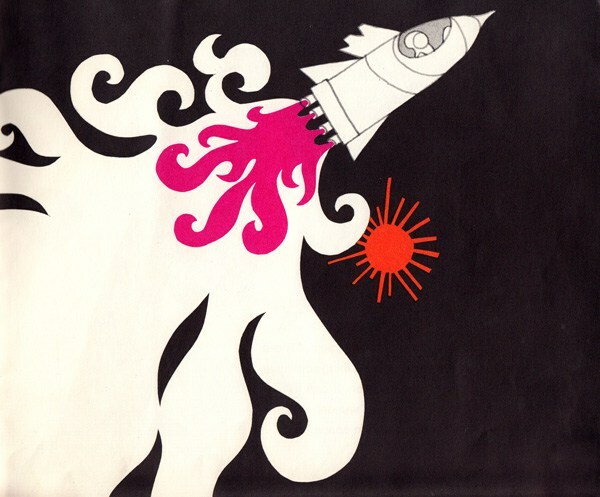 Example 1: the illustrations in Blast Off. 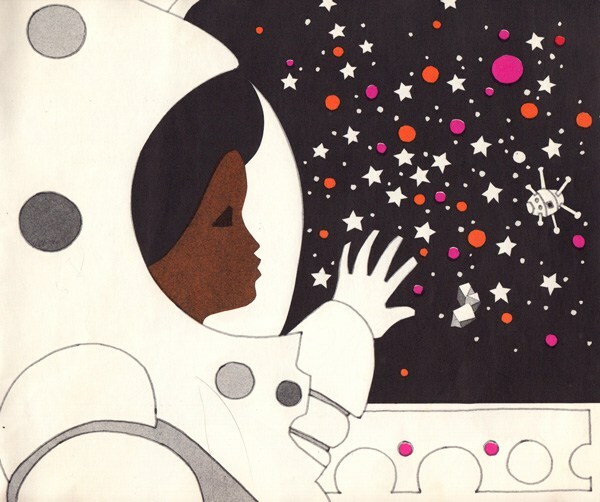 This book, published in 1973, beautifully tells the story of a black girl who wants to be an astronaut. More about these images and details about the work can be found here . Can you imagine how boss this was in the 1970s? It’s still super boss now. 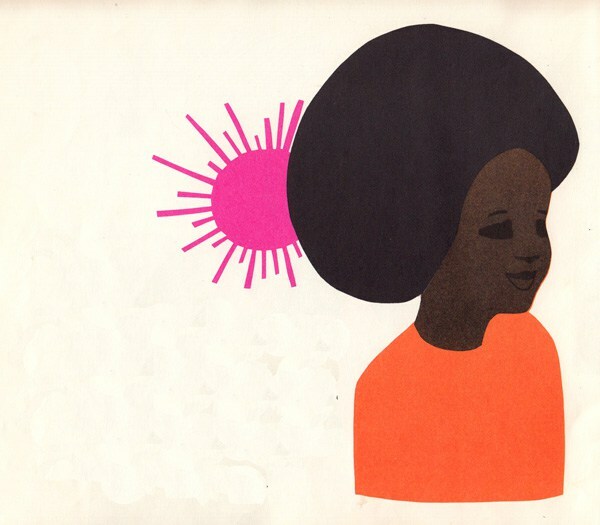 These illustrations were created by the husband and wife team, Leo and Diane Dillon, whose oeuvre of work is impressive and vast. 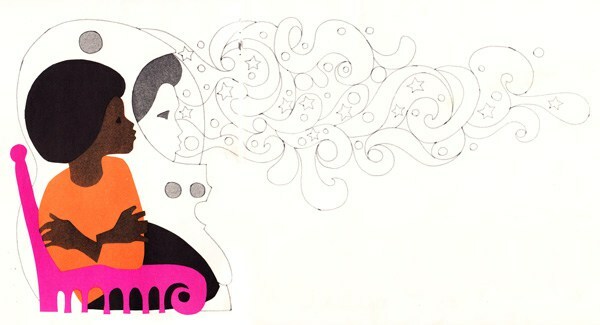 They broke boundaries as African-American illustrators, wining awards including the prestigious Caldecott Award, the Hugo Award, and the Balrog Award for their commitment to science fiction and fantasy. Giving credit where credit is due, this amazing work was spotted in Google Cultural Institute, Black History and Culture which they linked to on their homepage earlier this week. Using their pieces, I’ve started my own gallery. While I figure out more pieces to add, think about what gallery you want to create and share it! Guess Like The Jeans. Flavor Like Pralines. Of course something like denim has more than permeated pop culture and fashion brand’s influence on the landscape has been well noted. Few brands in the 90s were as noted as Guess. 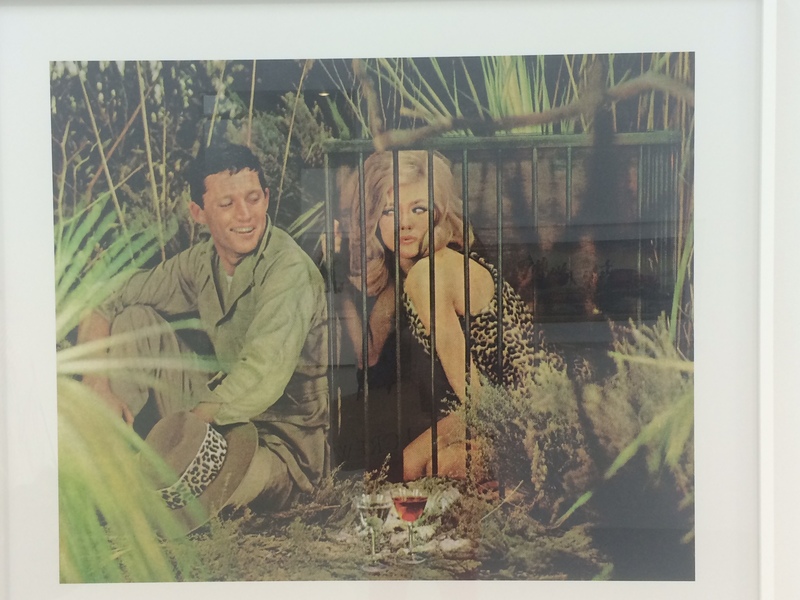 But at this exhibit at the Fashion Institute of Technology, brands from several eras are featured. Denim is perennial style, and this is a complete timeline of #denimhistory . From original work styles to 70s glam, the exhibit eventually ends with modern styles. I didn’t see JNCO represented, but these Moschinos below gave all the joy a visitor could want. So if we’re not honoring Columbus today, we can honor the people he met in the Americas. The Smithsonian National Museum of The American Indian (NMAI) offers a great place to start getting familiar with their history. If you can’t make it to the physical location, you can explore a lot of what the museum offers online. Let’s be careful as we construct new commemorations. In pushing to celebrate Indigenous People, let’s make sure we’re taking into account a well rounded view of the history of those here before us. Trust me when I say it wasn’t all peace pipe smoking, dancing with wolves, or trails of tears. 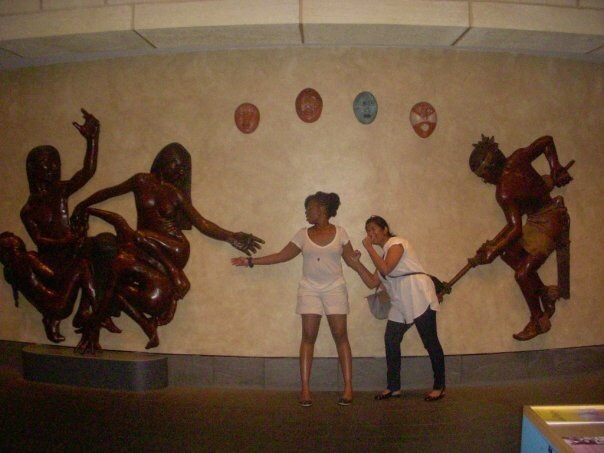 The museum helps you weave through the history with a variety of historical artifacts and interactive exhibits. Every time I go to DC, I make sincere efforts to get to the NMAI. It’s a great institution. But with the pains and insistence I often exhibit, you would think that I didn’t know about the National Museum of the American Indian-New York. Oh, I know about them alright. They quite perfectly rejected my docent application in high school. But my insistence on visiting the DC branch is not just a function of old resentment. 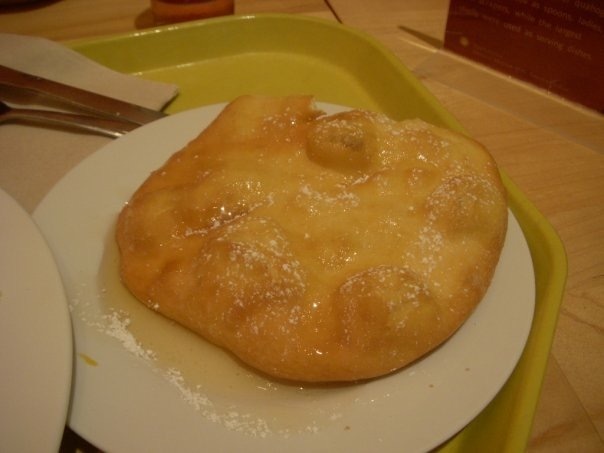 Rather, it is the great promise of fry bread at the DC branch’s cafeteria that pulls on my cultural heart strings. Consider this my additional endorsement. Yep, the picture is horrible, but the taste….the taste! 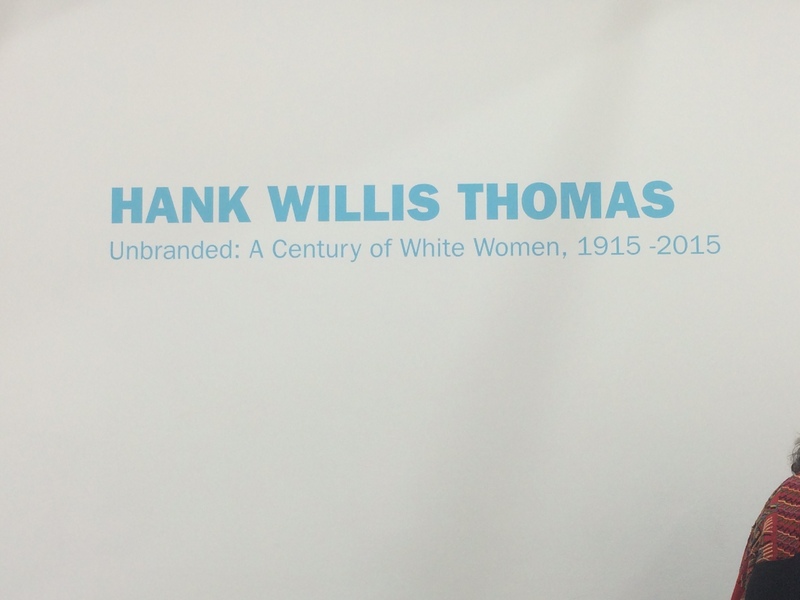 In my quest for fried pieces of dough, I have had the opportunity to engage with some amazing pieces of contemporary art, historical artifacts, and learn something more about the black Americans who are and are not part Cherokee. This doesn’t even begin to take into account the wonderful environmental aspect and attention paid to creating realistic feels of various parts of the States throughout the grounds. Today as I reflect on the holiday we’re supposed to celebrate- and yearn for fry bread-I also pause to honor those that were here before us, and whose descendants are still here today. Oh and one more thing, we’re calling out Columbus, not Italian culture at large. So there’s nothing wrong with a parade or zeppole today as well. I Walk a Lonely Road…. It’s the most wonderful time of the year: The New Fall TV Season. And surprise, surprise visual art once again has its place in the pantheon. Last season, a lot of talk was dedicated to the abundance of Kehinde Wiley and Basquiat work showcased on Empire. But the Lyons family isn’t the only hip hop obsessed family with an eye for art. 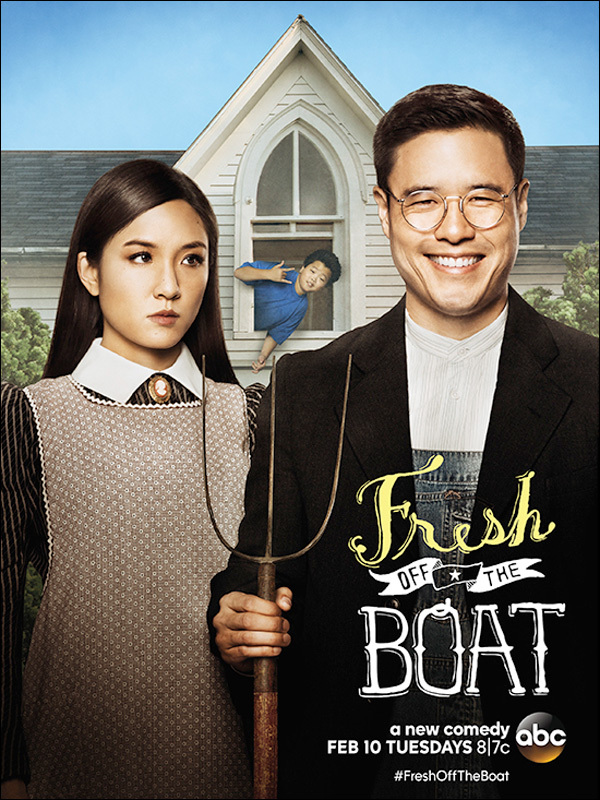 It turns out Fresh Off the Boat has also been making it’s own statements. Both season one and season two features American art classics reimagined with the Asian American cast for the promos. The first season channeled American Gothic. Season 2’s art work is a bit more modern and takes on Edward Hopper’s Nighthawks, painted in 1942. Because Nighthawks is so accessible it has been used in pop culture often, in everything from The Simpsons to The Tick. 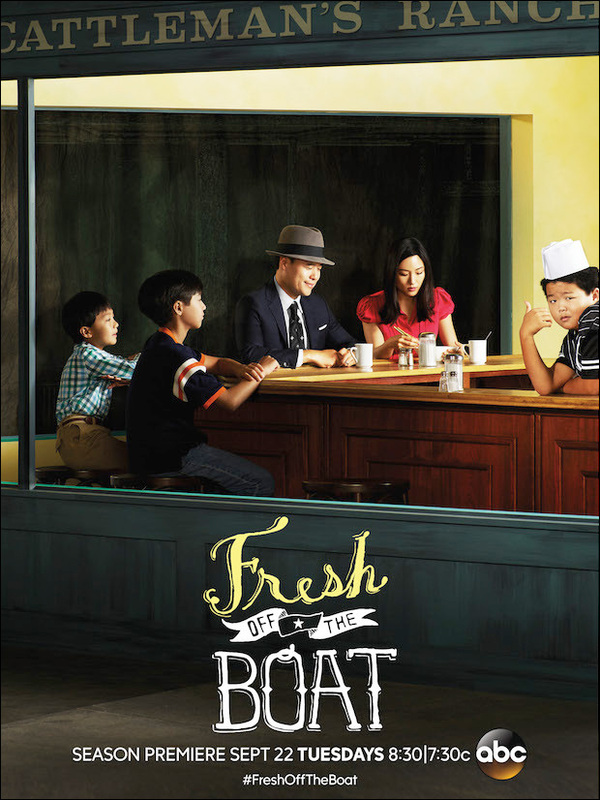 Fresh off the Boat’s take is unique because of the explicitness and details of the characters: a multigenerational Asian American family. 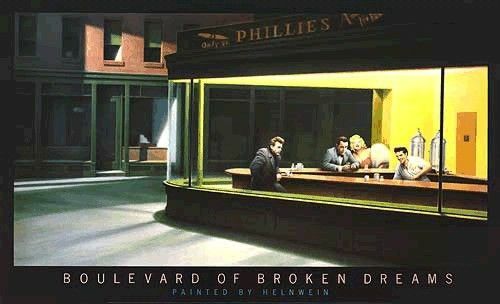 While I love this take on the painting, I have to admit my favorite version has always been Gottfried Helnwein’s Boulevard of Broken Dreams. Perhaps it was being able to easily identify characters that I did not identify with that allowed me to connect with this pop culture infusion of the work. Thanks Hopper for the gift of art that keeps on giving. A new play about Seneca Village, a black community that once existed in the modern day Central Park area, has been garnering attention. For one, intellectual America is having a national moment about all things Civil War related. Seneca Village, a community that was vibrant between 1825 and 1867, before being torn down for the Vaux and Olmsted meh park, definitely falls into the category of kind of sort of part of the nation’s forming at the time of the War. Also, New York is definitely going through a moment with confronting ideas about gentrification and displacement. Earlier this year, Creative Time along with the Central Park Conservancy presented Drifting in Daylight. They too took time to recognize Seneca Village. Karen Olivier’s piece, HERE AND NOW/GLACIER, SHARD, ROCK was a billboard that made the view contemplate the changes in time with artifacts from Seneca Village and imagery of the current site. The billboard changed as you walked pass, and I was able to capture really cool video. Unfortunately people’s private conversation about spirituality was also captured, so you get my stills. Also, check out Creative Time’s site on the installation here. The People Before the Park by Keith Josef Adkins; directed by John J. Wooten. 1856 is playing until September 20th at the Kean Theater in New Jersey. More information is available on their website. So, lots of people admire Starbucks’ wonderfully artsy and inspired siren branding, but where else does the everywhere coffee brand and public bathroom pop up in connection to art? The Museum of Chinese in America (MOCA) has the answer. Tyrus Wong is celebrated for his artwork, namely his contribution to movies. While it’s his drawings for Disney’s Bambi that brought him fame, he also did a lot of preproduction sketches for live action movies. 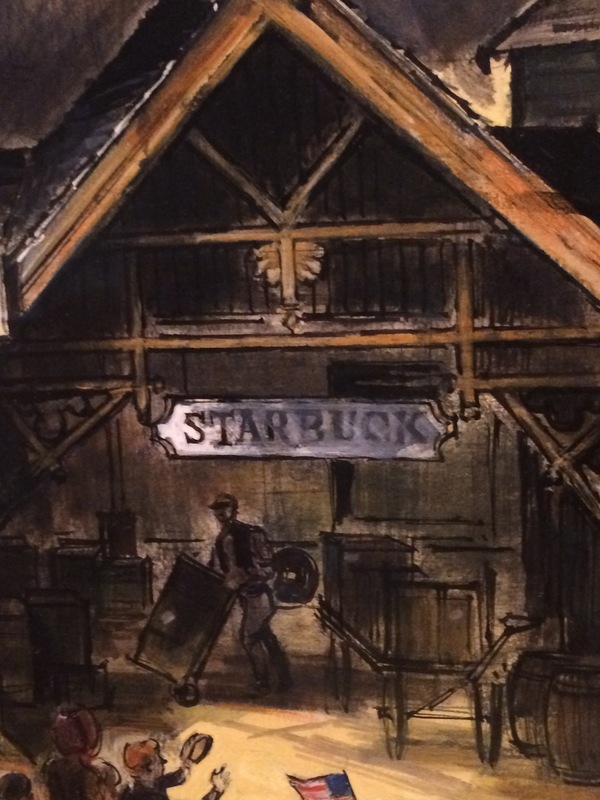 This early Starbuck saloon appears in a preproduction sketch for Warner Brother’s The Wild Bunch, released in 1969. Tyrus has an interesting story which is explained in the exhibit, Water to Paint, Paint to Sky: The Art of Tyrus Wong, which is currently on display at MOCA through September 13th. If you check it out, also be sure to look at some of the historical information on Chinese-Americans as well as the kites. Because when isn’t it a perfect time to go fly a kite? 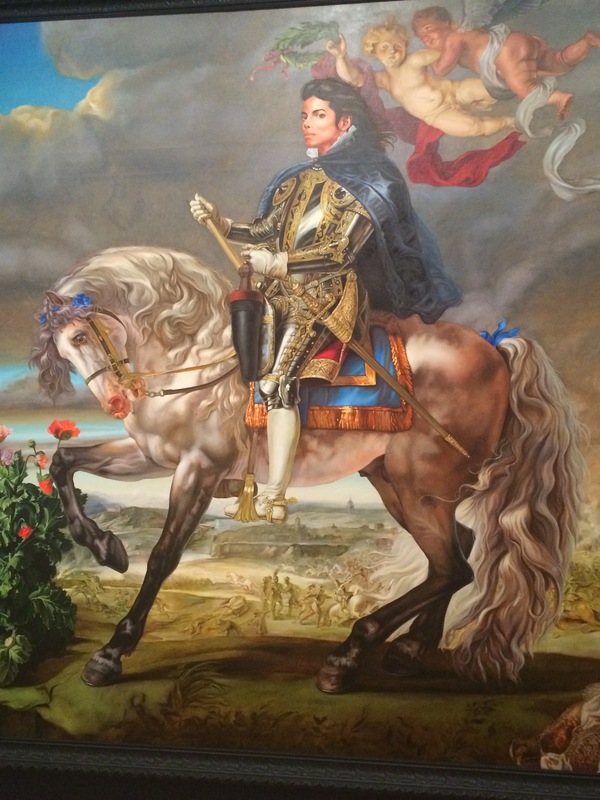 Equestrian Portrait of King Philip II (Michael Jackson), 2010. There’s a but, of course. In the current issue of Commentary Magazine, Lewis argues that we shouldn’t be fooled by the gleaming appearance of the art world today. He tells NPR’s Scott Simon that most Americans have in fact become indifferent to art.